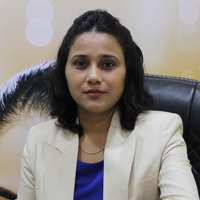 After achieving the highest academic qualifications MD, DNB (Diplomate of National Board) in dermatology Dr.Prajakta has further received special trainings in the field of cosmetic dermatology thus developing excellence both in skin care and cosmetology. She has worked previously with reputed institutes like Kaya Skin Clinics, SevenHills Hospital etc. With her vast professional experience in the field of dermatology she is known for her innovative and resourceful solutions for different skin concerns. Her areas of interest include Acne, LASERS, Hair root therapy, Mesotherapy, Botox and Fillers. She has presented many scientific papers in acne, acne scar therapies as well as other common skin and cosmetic concerns. Sincere and compassionate approach towards all her patients distinguishes her from others. With all her expertise she aspires to provide genuine, scientific and efficacious skin and hair care at SkinSpace.